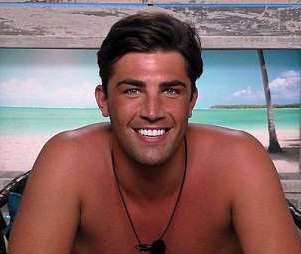 Love Islander Jack Fincham has already made an impression on the show and has everybody talking about his teeth. Why, do you ask? And you probably don’t ask, but I’ll tell you anyway, it’s because they’re really white. Super white. It turns out he went to Turkey to get them done, which I’m told, is because it costs less, and viewers have been having an absolute field day on Twitter as you can imagine. Can anyone bob over to mine with some nurofen? The bedroom lighting will be provided by Jack’s gnashers. The 26-year-old certainly has a big, bright smile, courtesy of veneers, but photos of him before have now surfaced. And when I say ‘surfaced’, I mean somebody, somewhere, has trawled through his Instagram page and found some. Matching tracksuit gang @oliverfincham ?? Now, I couldn’t be less bothered, but if I do have to comment on them, they’re absolutely fine as they were, a little less radiant, yes. People have also been talking about his resemblance to another two ‘reality’ stars. Joey Essex and James Argent. Yep, people think he looks like the love child (if it were possible) of the two The Only Way Is Essex stars. WHY does Jack look like Arg and Joey Essex had a baby??? #LoveIsland. It’s not just Jack everybody’s talking about. Fellow contestant Adam Collard caused quite a stir when he revealed his age on the programme. Adam was tasked with being the destroyer of love on the show, as he entered the villa after all the couples had already been paired up. Adam, who’s a personal trainer, was trying to win over the girls in the house when he revealed his age. You see, Adam revealed he was only 22-years-old, and the minds of those watching across the country were simultaneously blown. Viewers absolutely refused to believe this, and tweeted their comments. The only way Adam is 22 is if he was born on a leap year. The series started on Monday night (June 4) and alongside Adam and Jack, the show welcomed other contestants to the villa. The stars this year are Samira Mighty, Kendall Rae-Knight, Hayley Hughes, Laura Anderson, Dani Dyer, Niall Aslam, Eyal Booker, Adam Collard, Jack Fincham, Wes Nelson and Dr. Alex George. Twitter users have been making lists of the contestants and judging them. Others have been petitioning for Gogglebox to film Danny Dyer’s reactions to the show, as his daughter Dani is one of the contestants this year. Now that, I would like to see. Love Island continues weeknights on ITV2 at 9pm.